Universal Solutions Review 2019: Is Universal Solutions a Good Hosting? 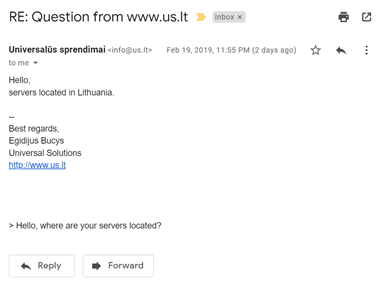 Lithuania-based Universal Solutions offers a basic set of bare-bones hosting solutions from a bare-bones “old style” website that doesn’t bode well for its ancillary web design services. But support is responsive. Lithuania-based Universal Solutions has been providing quality internet solutions to local and international customers since 2005. In addition to regular web hosting, it also offers SMS hosting, which merely means you can pay for your hosting by sending an SMS message every month. The Universal Solutions website can be switched between the Lithuanian and English languages. In addition to regular web hosting and SMS hosting (which is pretty much the same thing but payable by SMS message), Universal Solutions also offers domain registration, and website design and development services. 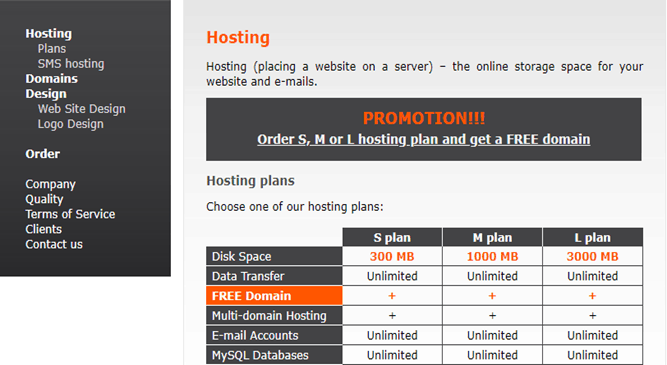 The three web hosting plans come with unlimited data transfer, a free domain, multi-domain hosting, unlimited email accounts, and unlimited MySQL databases. The most basic ‘S’ plan starts out with limited 300 MB disk space, which can be upgraded to as much as 3000 MB on the high-end ‘L’ plan. It’s still not enough space for a demanding website, and the payable-by-SMS plans offer even lower resources of 100 MB to 1000 Mb disk space. Few beginner-friendly features are advertised for these hosting plans, so you won’t find any intuitive control panel, drag-and-drop website builder, one-click installer, or even an SSL certificate. As already hinted, Universal Solutions also offers website design and development, SEO, CMS, and e-commerce solutions as separate services. Although the hosting plans provide limited disk space, the unlimited other resources may make them worth the price you pay by PayPal or bank transfer. You can pay for plans on billing cycles from three months to 24 months, with up to 63% discount for a two-year commitment. You might think it’s worth taking this chance even though there is no money-back guarantee as far as I can see. Although there are no SSL certificates on offer (free or otherwise), you do get a free domain with your hosting plan. Placing an order is easy, but the order pages seem to be insecure (not HTTPS), at least until you get to any final payment step. Universal Solutions has a retro-looking website that sells very simple hosting solutions with some unlimited resources but few beginner-friendly features. It does the job, but it’s not the most modern hosting vendor you will find. Find a simple set of hosting solutions at Universal Solutions. Wondering how Universal Solutions stacks up against other Web Hosting companies? Enter any other Web Hosting company and we will give you a side-by-side comparison.